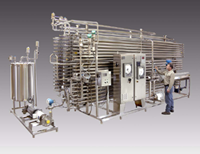 BEECO offers several types of tubular heat exchangers to meet your process needs: tube-in-tube, multi-tube and shell & tube. For pulpy products or unique viscosities we offer multi-tube and tube-in-tube heat exchangers. For hot sets or high temperature steam applications, we offer shell & tube heat exchangers that are superior in handling steam to water heat transfer without allowing the steam to deteriorate the materials within the heat exchanger. Contact us and we will work with you to recommend a unique heat transfer solution to meet your process needs.